Issue 22 - Summer Vacation Issue! You've been working hard, so let PM take you on that vacation back to the early 60's and Disneyland! 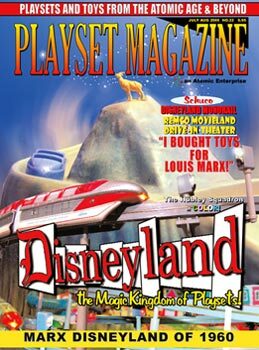 We've got Eight Big Stories for you this issue, starting with a miniaturized visit to the Marx Disneyland Playsets on the centerfold! We've examined several mint sets to try to figure out the variations for you. BIG PLUS THIS ISSUE! An interview with Mr. Eddy Fury. Eddy worked at Marx from the late 40's until the company closed, and in between being the office boy and a salesman for the company, he was actually the one sent out by Louis Marx to purchase competitors toys! Hes's got some very funny stories to tell you. by Schuco. You'll get a crash course in this highly desireable collectible-- and maybe stimulate your interest, too. photos and personal memories of a Playset - filled childhood. Perfect to cool off those hot summer nights. 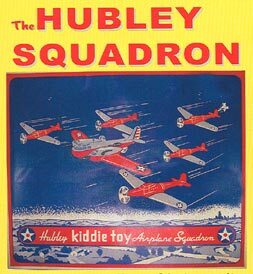 Hubley's retro-futuristic airplane squadron. This set is so elegant and eye-catching it has to be in color!